It took every inch of the Large Hadron Collider's 17-mile length to accelerate particles to energies high enough to discover the Higgs boson. Now, imagine an accelerator that could do the same thing in, say, the length of a football field. Or less. That is the promise of laser-plasma accelerators, which use lasers instead of high-power radio-frequency waves to energize electrons in very short distances. Scientists have grappled with building these devices for two decades, and a new theoretical study predicts that this may be easier than previously thought. If their models prove correct, they could help lower the cost of high-energy physics research -- the Large Hadron Collider cost $9 billion -- as well as many other industrial and medical applications of accelerators. "The effect is like the wake of boat speeding down a lake. If the wake was big enough, a surfer could ride it," Leemans, who heads the BELLA Center, explained. "Imagine that the plasma is the lake and the laser is the motorboat. When the laser plows through the plasma, the pressure created by its photons pushes the electrons out of the way. They wind up surfing the wake, or wakefield, created by the laser as it moves down the accelerator," he said. This is how they accelerate electrons so rapidly. For example, Stanford's Linear Accelerator Center takes two miles to drive an electron to 50 billion electron volts (GeV). Leemans' experimental laser-plasma accelerator takes electrons to more than 1 GeV in slightly more than 1 inch. It takes a lot of laser power to generate a wakefield. For example, BELLA's petawatt (1 quadrillion watts) laser has a 10 meter x 10 meter footprint. It generates 400 times more power than all the world's power plants combined, though only for 40 femtoseconds (40 quadrillionths of a second). Unfortunately, it takes BELLA's laser a full second to recharge and send a second pulse. 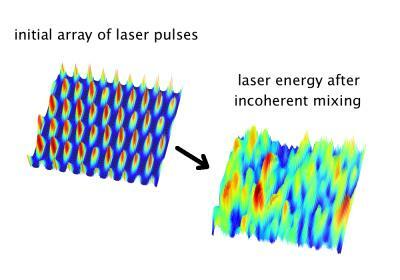 High-energy physics research requires tens of thousands of pulses per second. Many other applications would benefit from multiple pulses per second. BELLA's laser has the highest repetition rate of any petawatt laser in the world. Building a faster petawatt laser would require a heroic feat of engineering. Such precision would be expensive and presents serious technical problems. But the concept of combining lasers got Leemans' team thinking. "Instead of one big push, we would give it many smaller pushes at roughly the same time. It's not quite perfect, but the swing doesn't really care. It averages over all these little pushes and up it goes."